A holiday house in Jurmala got its continuation; an extended recreation center, including a swimming pool, steam room and sauna, gym, kitchen unit, a few guest rooms and a garage. Taken together, the total number of automation modules of Domintell exceeded 185 units – 130 groups of lighting, 54 control modules, 60 different types of shutter drives and sliding doors (insulating glass doors in the pool are also controlled remotely), 30 heating zones and 12 zones of conditioning. The complex was built from the ground up and put into operation in just one year. Our company did all the installation work of electricity, networking and communications. The ventilation system of the premises and facilities Komfovent and the pool Menerga are controlled via Modbus TCP protocol with full feedback. To achieve a sense of comfort when in the pool room, smart home system maintains the set temperature graph and humidity level in the room depending on the temperature of the water in the pool. 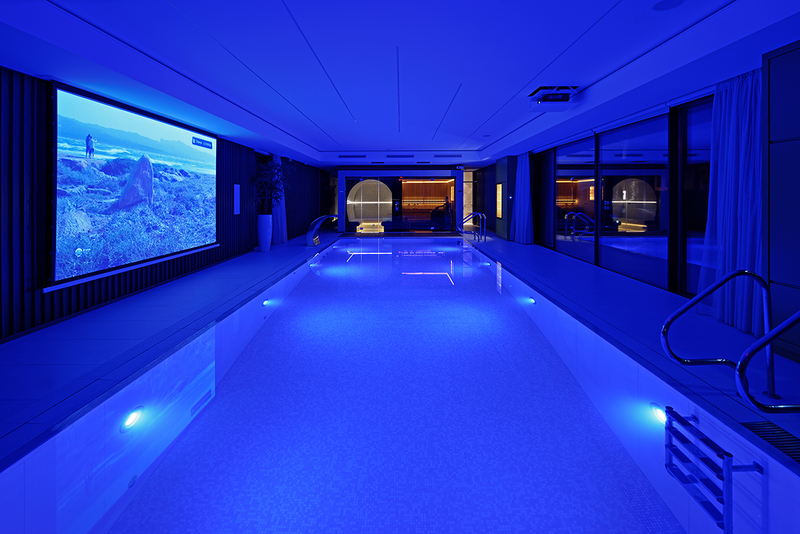 With LED RGB projectors built into the pool wall and ceiling and RGB LED backlight you can create a light atmosphere depending on the mood – a choice for the customer. The setting of the desired temperature in the bath complex (2 saunas: dry and wet) can be done remotely: it is sufficient to activate the scenario on your smartphone or tablet. Video projection system and a large screen in a complex allows you to watch the news through satellite TV, IP TV or family videos from a network drive, even taking water treatments. HD-video sources are available via two server rooms with full access to view the content on any of the TVs. Video switching system is very flexible and easily allows in the future to change the source for more advanced, such as 4K compatible. You have added a second entrance from the street? It would suffice to add a second IP door panel, the receiving end being the same tablet computer or a smartphone. If the electricity supply is interrupted, the system will notify about this in a timely manner and make the transition to backup power from a diesel generator. When the supply is restored, the power supply system will go into normal mode and the smart home will report on it. It is possible to monitor the level of fuel and generator failure as well. Modern security system and video monitoring of the premises and the site is emplyed. To monitor and manage all engineering communications, the complex uses an iPad with preinstalled i2Control from iRidiummobile Ltd.